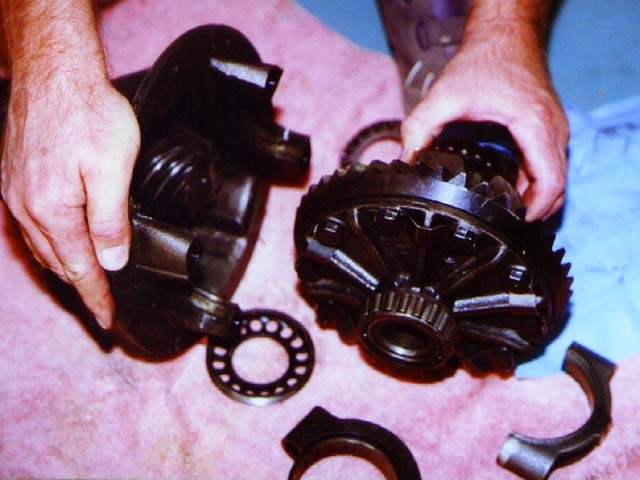 This article discusses how to change and setup gears, bearings, and differential carriers in Toyota third members. Our particular install discusses installation of an ARB air locker and 4.88 gears. It assumes you have already removed the third member from the vehicle and are ready to begin disassembly. Along with your regular metric wrenches and sockets you'll need a 30mm socket for the pinion nut. To setup the gears and bearing preload you'll need a dial or test indicator and holder (magnetic stand, etc. ), and a press to remove and replace bearings. 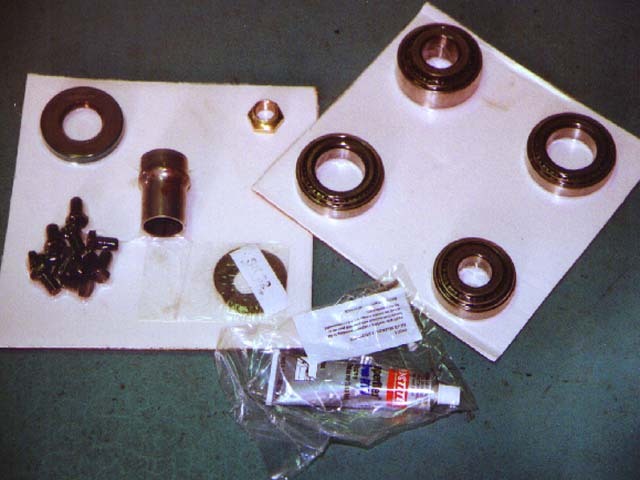 A brass or other drift is also needed for bearing race installation. Homebrew or purchased tools are required to fit the adjuster nuts and to hold the pinion flange. Each of these is easily made as discussed below. Remove the lock tabs on the carrier bearing caps using a 12mm wrench or socket. Mark the two bearing cap pairs as to their location. I usually use a small punch to place punch marks on the upper and lower bearing cap areas so I know which cap goes on which side. Remove the bearing cap bolts. I prefer to break torque on each slightly, one-by-one, before removing the bolts. Remove the bearing caps. It may take a small tap with a hammer or mallet to loosen them. 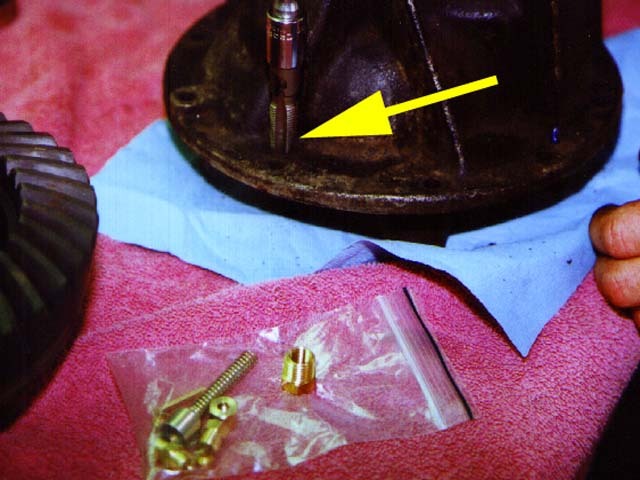 Remove the pinion nut, washer, and driveshaft flange using a 30mm socket. 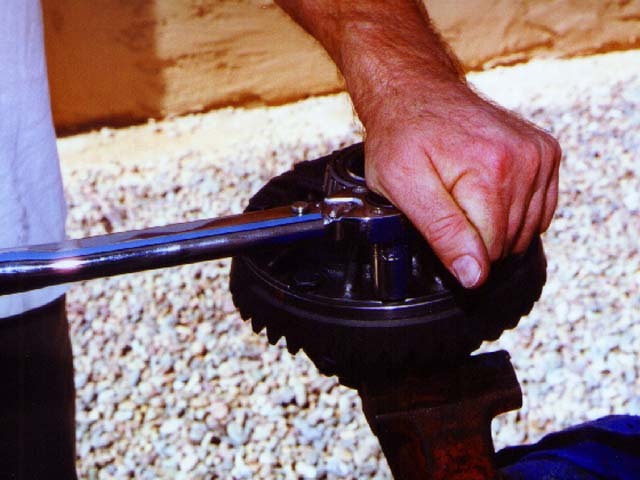 You'll need to fabricate a tool to hold the pinion flange while you loosen the nut. I use a small scrap steel bar (actually an old brake pedal lever) drilled with two 5/16" holes to mate to two of the pinion flange holes (this same bar is also drilled and supplied with two roll pins for use in turning the adjuster nuts). Secure this tool to the flange using a pair of bolts and nuts. I add a piece of pipe to the end should I need more leverage when loosening the nut. 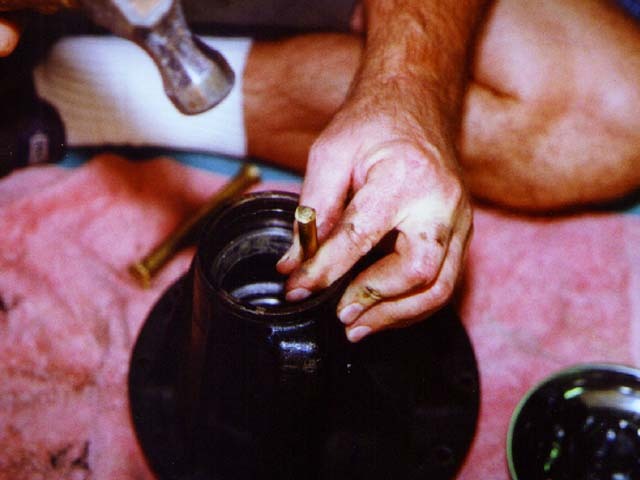 Use a brass drift or steel punch in the middle of the pinion end to drive the pinion out of the housing. In some cases, the assembly will simply fall apart. 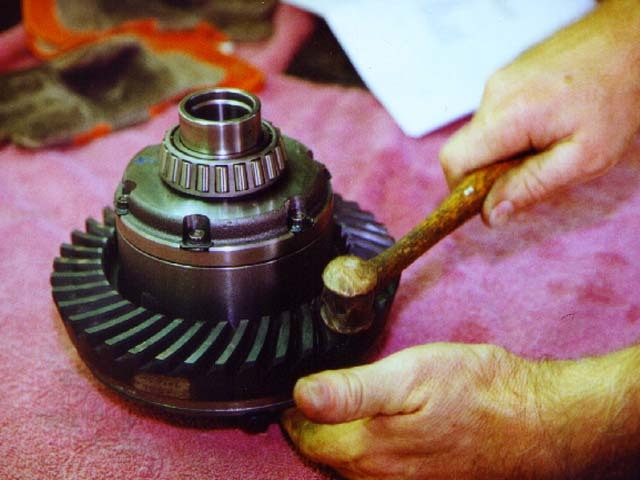 In other cases, the bearings may be stubborn and you may need to resort to a press to lightly push the pinion out. Most instances lie somewhere in between and a few hammer taps will drop the pinion out of the housing. Be careful not to damage the threads on the end of the pinion. With the pinion removed from the housing, press the old rear bearing off the pinion. Keep the shim behind this bearing for use later in this install. 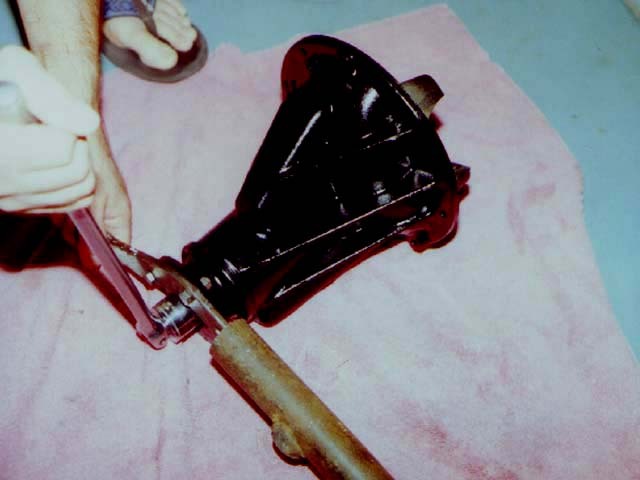 Use a pry bar to pull the old pinion seal out of the housing and remove the oil slinger (looks like a large thin washer). The front pinion bearing will also fall out of the housing at this point. Drive the head and tail bearing races out of the housing. I usually like to use about a 3/4" steel bar to do this. Be careful not to scar the cast race recesses in the housing. Tap the races from side to side to slowly work them out. The case should now be stripped clean of parts and can be thoroughly cleaned in preparation for the installation of new parts. 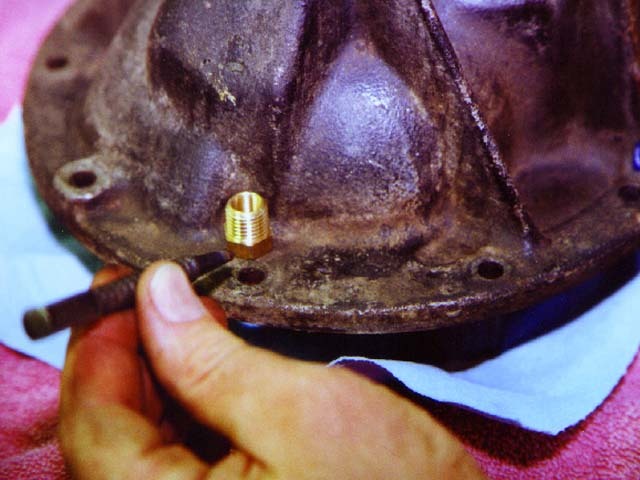 If you're installing an ARB, it is a good idea to drill and tap the housing for the 1/4" NPT hose fitting at this time. Before installing the ring gear you can press the new carrier bearings onto the carrier. We used a standard install kit available from most aftermarket parts dealers. It includes bearings, shims, ring gear bolts, marking compound, crush sleeve, etc. Before installing your ring gear, it is wise to double check the gear ratio to ensure it is truly the one you expect to have. Count up the teeth on the ring and the pinion, and divide the number on the ring by the number on the pinion to determine the ratio of the gears. Clean the mating faces of the ring gear and the carrier mating surface. I like to use carb cleaner to do this. Using a fine finish flat file, lightly file the carrier mating face of the ring gear and its mating face on the carrier itself. As this is a precision assembly, we want to ensure there are no burrs or high spots on either face to disturb the good, flat seating we want between the two. To make installation of the ring gear easier, you may want to preheat the ring gear to allow it to expand slightly. If you've cleaned the ring well and have access (and spousal permission) to use an oven, this is the best way. Do not exceed about 200 deg F. Heat for 10-15 minutes. Have the carrier ready to accept the ring gear and have a couple of ring gear bolts handy. Take the heated ring gear and slip it on the carrier, trying to line up the bolt holes. You can use a drift hammer or soft metal punch to help tap the ring all the way onto the carrier. With it heated, it should slip on fairly easily. If needed, use your drift to tap on the teeth edge to spin the ring slightly to line up the bolt holes. Install two bolts snugly to hold the ring gear in place. Do not use the ring gear bolts to pull the ring gear onto the carrier. Differential carrier assembly is now complete. The diagram below shows the related pinion components and how they are positioned. Install the original shim removed from the old pinion onto the new pinion and press a new rear bearing onto the new pinion. This shim determines the pinion checking distance (CD). This will be discussed more later. As a starting point, it is best to begin the process by using this original pinion shim that came with the housing you are using. With the case clean, drive the new pinion bearing races in using a brass or other soft metal drift. Make sure they are fully seated in the case recesses. You can tell this when the sound from the drift changes pitch and you can feel with your hand that the drift is hitting solidly. Slide the pinion with new rear bearing (lightly oiled) and original shim into the case. Next, add the new front bearing (lightly oiled), oil slinger, driveshaft flange, washer and nut. DO NOT add the crush sleeve (or solid spacer) to the assembly at this time. 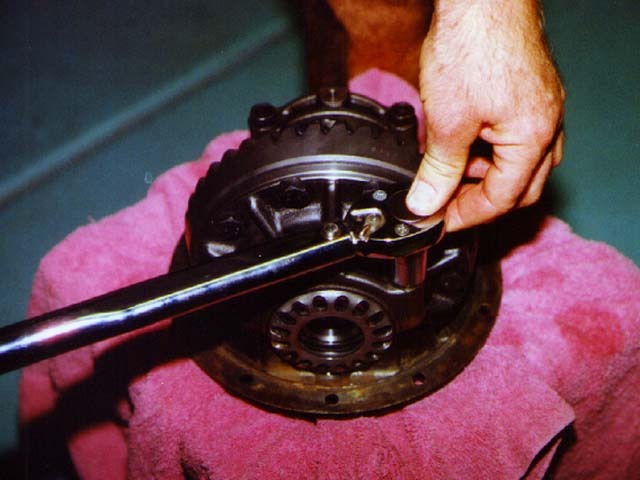 Tighten the flange nut snugly to pull the pinion assembly together and seat the bearings in the races. 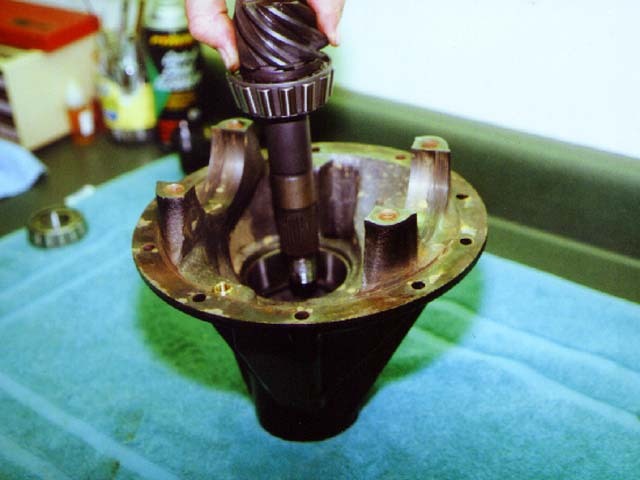 We will use this temporary assembly to check the pinion depth before proceeding further. The pinion depth, or checking distance (CD), is the distance from the flat end face of the pinion to the centerline of the ring gear. 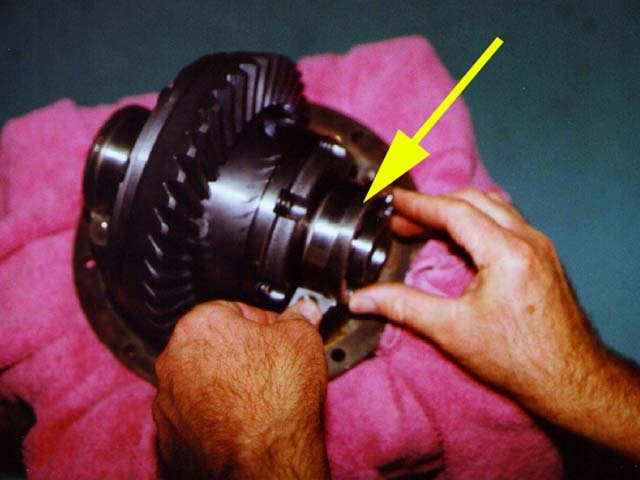 The center of the ring gear is also the center axis of the bearing caps, and the plane where the two bearing caps separate. The CD is one measurement that determines where the pinion meshes with the ring gear. The CD should be set to within about 0.002" and is determined by the size of the shims behind the rear pinion bearing. 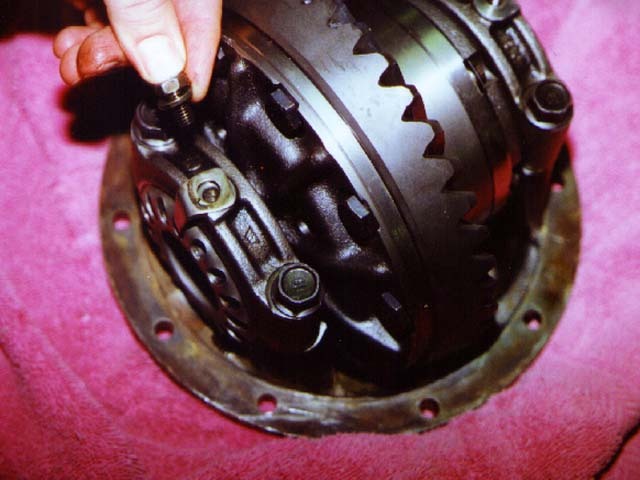 If the CD is too short, the pinion sits too high in the case and rides more toward the toe of the ring gear. 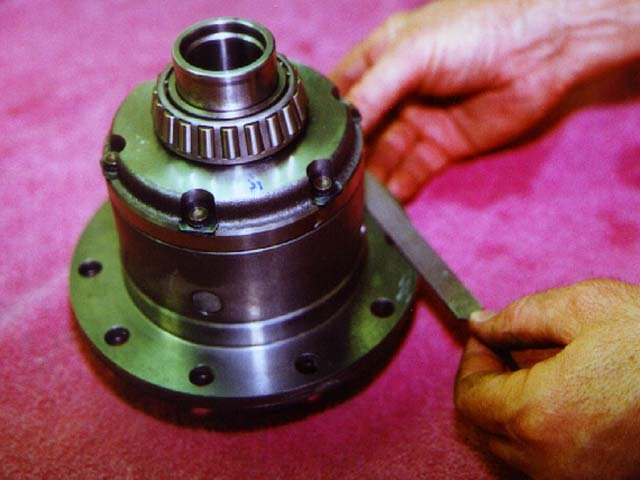 If the CD is too long, the pinion sits low and rides more toward the heel of the ring gear. Proper CD will allow the pinion to mate more evenly in the middle of the ring gear width for optimum mesh and strength. 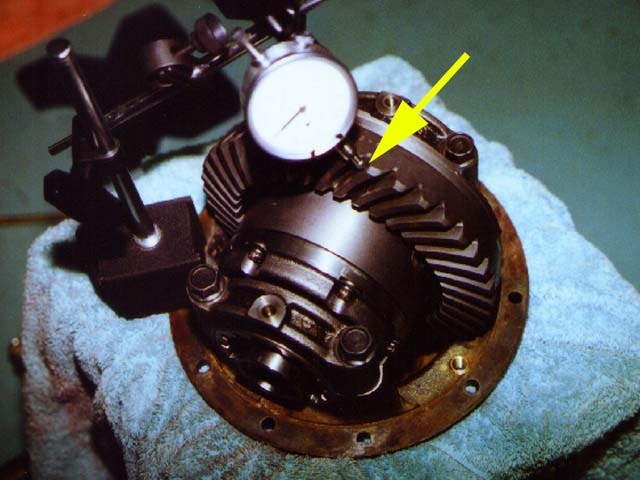 With the pinion temporarily installed in the case, there are two ways to determine if the CD is correct. 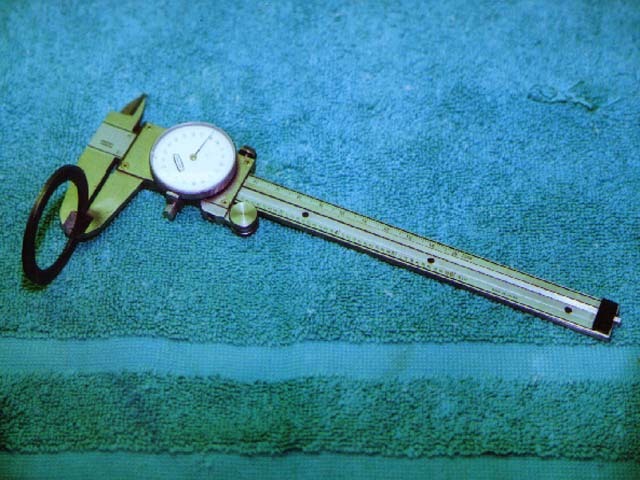 The first way is to simply measure the CD, if you have the proper tools. You need a precision machined flat bar to span the flat bearing faces and a depth micrometer. You also need to have the checking distance for the particular gear set (sometimes etched on the end of the pinion gear). 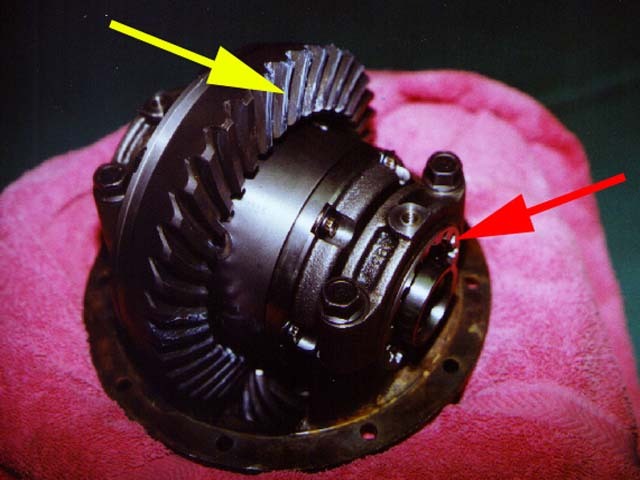 However, Toyota gears sets are not always marked with this information, so the second method is typically used. 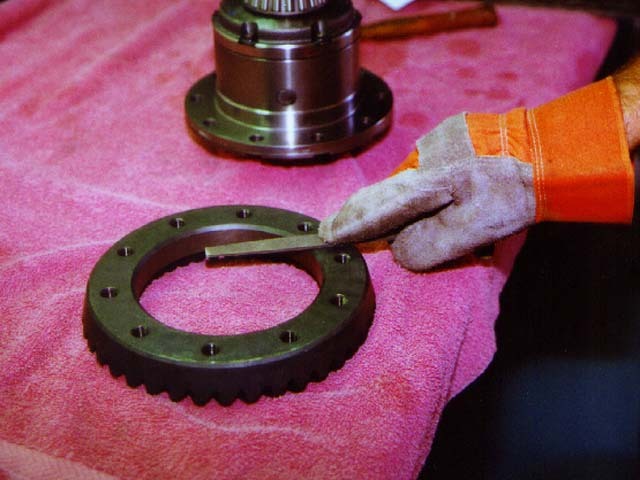 The second way to set the proper pinion depth is to temporarily assemble the carrier and check the gear mesh pattern using gear marking compound. I will explain the second method here. Install your carrier with bearings (lightly oiled) and races into the case. Install an adjuster nut on each side of the carrier. One way is to set the adjuster nut into the housing threads and then turn a 1/2 turn or so to ensure it is correctly seated in the threads. A drop of oil on the threads makes them turn smoother as well. Next, install the bearing caps (making sure you have the right caps matched up). There is an easy way to ensure they go on correctly and line up with the adjuster ring threads. Holding the bearing cap above the bearing, install each of the bearing cap bolts a few turns. This will line up the bearing cap to within less than a thread pitch distance. With the bolts started for alignment, drop the bearing cap on the case and tap in place lightly. The threads should mate just fine using this method. Lightly snug the bearing cap bolts. Now is the time to set the ring gear backlash (BL). The backlash is the second measurement that determines how well the pinion meshes with the ring gear. BL determines how close the ring gear sits to the pinion gear, or how deep the pinion teeth fit into the tooth depth of the ring gear. You want BL to be neither too loose (poor mesh and driveline slop) or too tight (excessive heat and gear wear). Backlash is typically checked using a dial or test indicator. The measurement is made on the face of the one of the ring gear teeth, perpendicular to its meshing surface. 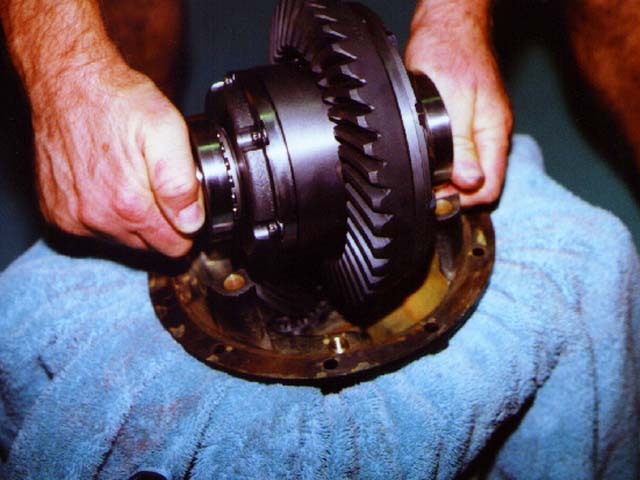 With the pinion held steady, the ring gear is rocked back and forth, and the play between the pinion and ring gears is measured. Toyota factory spec is 0.005" to 0.007", while most aftermarket gear manufacturers seem to recommend 0.008" to 0.012". I always try to shoot for about 0.008". It is generally not good for any backlash measurement to be less than the specified setup number (etched on the side of the ring gear). It is also a good idea to watch backlash variation at 3 to 5 places around the ring gear. Overall, the backlash readings should not vary by more than about 0.002". With the carrier installed and the bearing cap bolts hand snug, dial in the backlash. First, tighten the adjusting nut on the ring gear side (side where the ring gear is closer than the pinion) to get a backlash reading of about 0.008". Next, tighten the pinion drive side (side where the pinion is closer than the ring gear) adjusting nut until it feels firm. Recheck the backlash. If the reading has increased above your previous reading, this means you have over-tightened and added preload to the bearings. 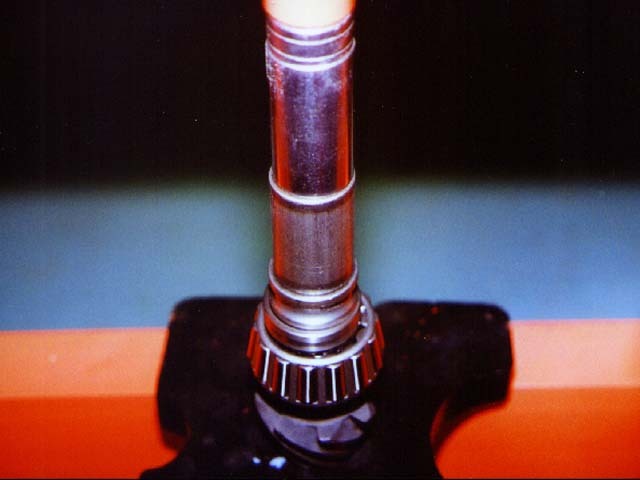 If the backlash has increased, loosen the adjusting nut to eliminate any increase in backlash. Once the correct backlash is set, the mesh pattern can be checked using gear marking compound. Marking compounds are a kind of greasy substance used to check the mesh pattern. Apply a small amount of the compound to about 5 teeth on the ring gear. 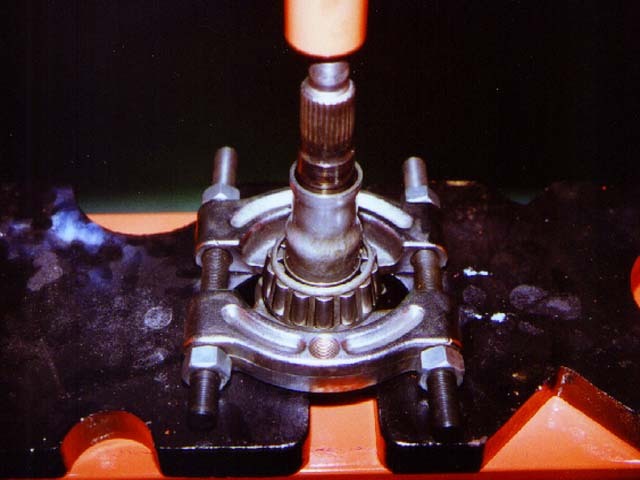 Rotate the pinion flange so that the compound is transferred around the ring gear. Apply more compound as needed. With the compound "tracked" around the ring gear, you can check the pattern. 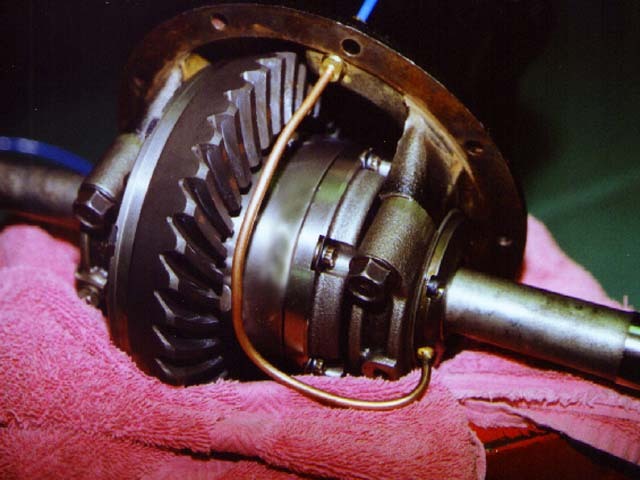 In general, you want the pinion to mesh near the center of the face of the ring gear tooth. That is, it should be about centered heel to toe, and centered top to root. Examples of possible gear mesh patterns can be found with the gear installation instructions that came with a new gear set. They are also shown in the factory repair manual. Once the pattern is confirmed as good, all the components should be removed from the housing to prepare for the final assembly where a spacer or crush sleeve will be installed. Crush Sleeve or Solid Spacer? 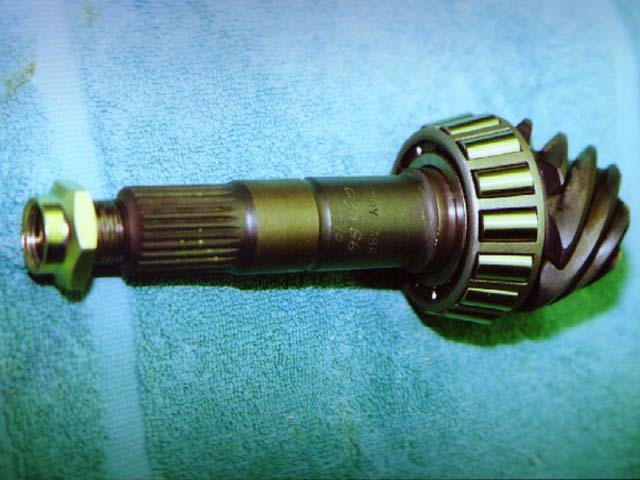 When installing the pinion, there are two ways to set the bearing preload. One is to use a tubular crush sleeve. 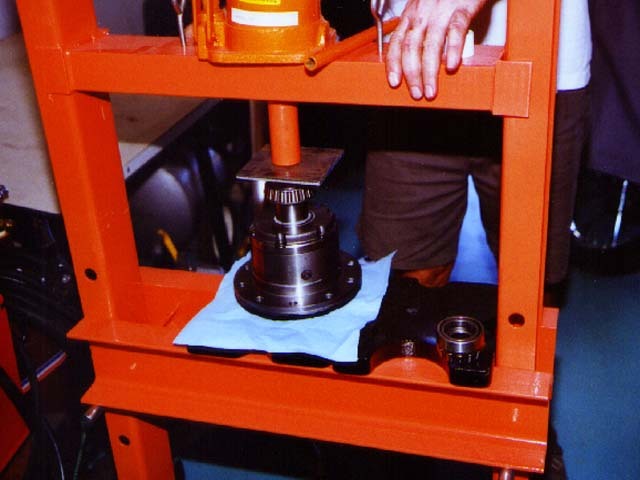 With this method a non-reusable crush tube is collapsed between the bearings when the assembly is tightened. The second method uses a solid cast iron spacer in place of a crush sleeve. Obviously, the solid spacer does not collapse, so shims are used with the solid spacer to accurately set the bearing preload. Shims are added and subtracted to get the proper preload. Toyota has used both methods over the years, with the solid spacers used mostly in the early years. There are advantages and disadvantages to both methods. The solid spacer takes more effort to install, but many consider it more stout. The claim is that should the pinion flange take a very hard hit on a rock or other immovable object, it is possible that a crush sleeve could be impacted and crushed slightly more. When this happens it leaves some freeplay in the bearings, and the assembly loosens slightly. How critical this difference is, cannot be quantified easily. Plenty of people have run crush sleeves for years with no problems, while others have reported problems with crush sleeves being damaged on the trail. Note also that the best quality crush sleeves (~$18-20) come straight from the dealer. These are seamless ones with about 0.078" wall thickness. All aftermarket ones I have seen have been seamed tube, with some as thin as 0.055". There are a number of misconceptions about the function and effect of the crush sleeve or spacer. Neither affects the pinion checking distance. 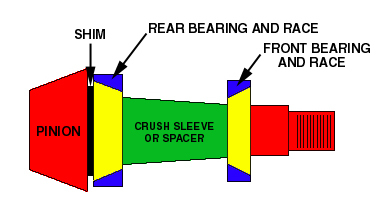 Also, when a crush sleeve is used, the flange nut is not tightened to a specific fastener torque, rather the nut is tightened until a specific bearing preload is achieved (as measured at the pinion flange). When a solid spacer is used, there is a specified fastener torque for the flange nut. According to a 1980 factory repair manual, this is 123 to 151 ft. lb. Drop the front bearing into the housing. Then install the oil slinger. Next, install a new pinion seal into the end of the housing. Tap the seal in so that it rests about 1mm below the outer ring of the housing. Add a few drops of oil to the seal surface. 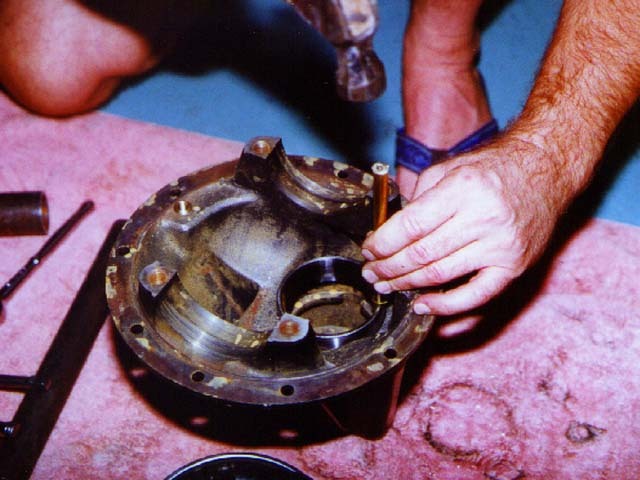 Install the pinion with rear bearing and crush sleeve through the end of the case. Add driveshaft flange, washer and new nut from the other end. Bolt your flange tool to the flange. Start tightening the flange nut. It will get very tight. There will still probably be about 1/8" endplay in the assembly at this point. An extension on your flange tool and a long breaker bar will be handy here. You may also want a friend to help hold the third member housing as well. 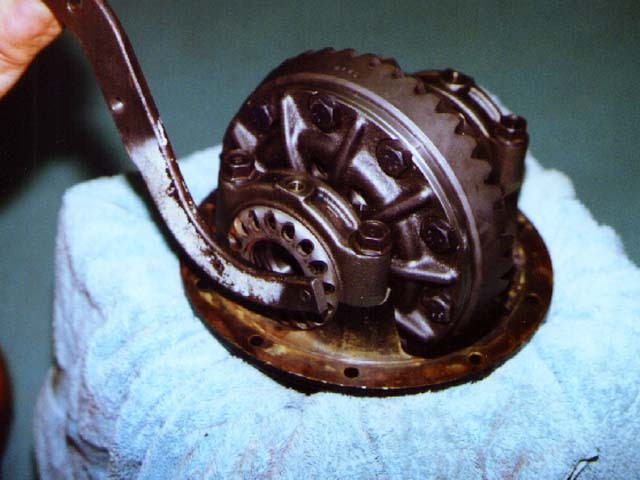 Final torque of pinion nut......go slow! Continue to tighten the nut. Work slowly and check the freeplay frequently. Eventually you will feel the effort needed to turn the nut decrease. This means you have finally gotten the crush sleeve to begin collapsing. As soon as the endplay disappears, you will start to add preload to the bearings. Proceed slowly, turning the nut a little at a time to add more preload. If you overtighten the nut, you will crush the sleeve too far. This will require you to start over using a new crush sleeve. Be careful! With the preload set, secure the pinion nut. 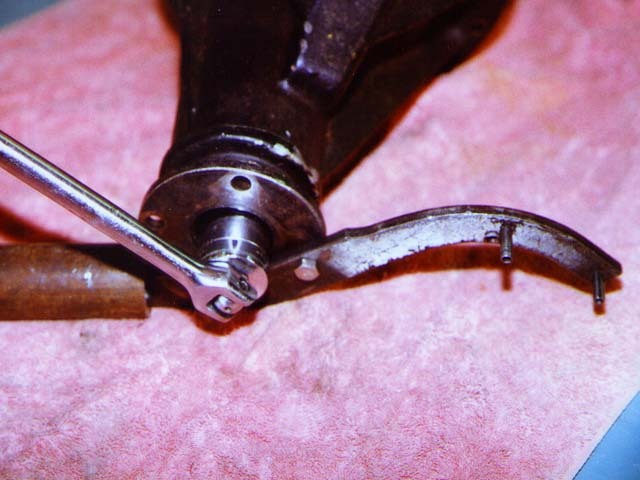 This can be done by peening the nut collar into the slot in the end of the pinion, or by tack welding the nut to the end of the pinion. Install the pinion with rear bearing, solid spacer, and original spacer shims through the end of the case. Add driveshaft flange, washer and nut from the other end. Bolt your flange tool to the flange. Torque flange nut to 123 to 151 ft. lb. Turn the flange a turn or two to seat bearings. Check bearing preload by feel or with torque meter. New bearing preload should be 16.5 to 22.6 in. lb. (Used bearing preload should be 7.8 to 11.3 in. lb.). Correct the preload by adding or subtracting shims as needed. 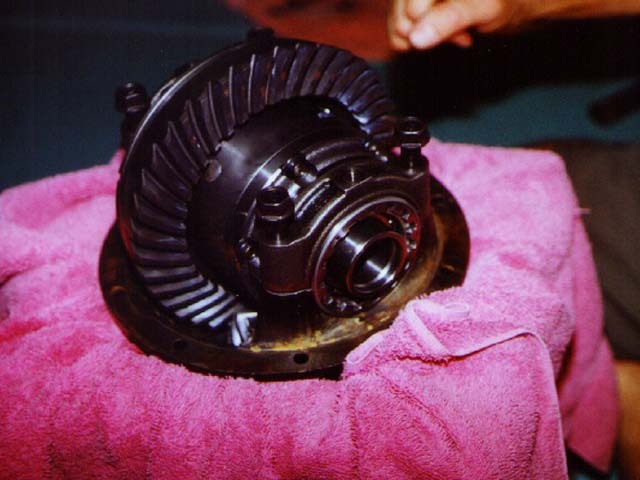 Now that the pinion has been permanently installed, reinstall the carrier, bearings, and bearing caps. (For our ARB install, we replaced the pinion side adjuster nut with the new nut and retaining ring provided by ARB.) Lightly snug the bearing cap bolts. Tighten the adjusting nut on the ring gear side (side where the ring gear is closer than the pinion) to get a backlash reading of about 0.008". Next, tighten the pinion drive side (side where the pinion is closer than the ring gear) adjusting nut until it feels snug. Recheck the backlash. If the reading has increased above your previous reading, this means you have over-tightened and added preload to the bearings. If the backlash has increased, loosen the adjusting nut to eliminate any increase in backlash. 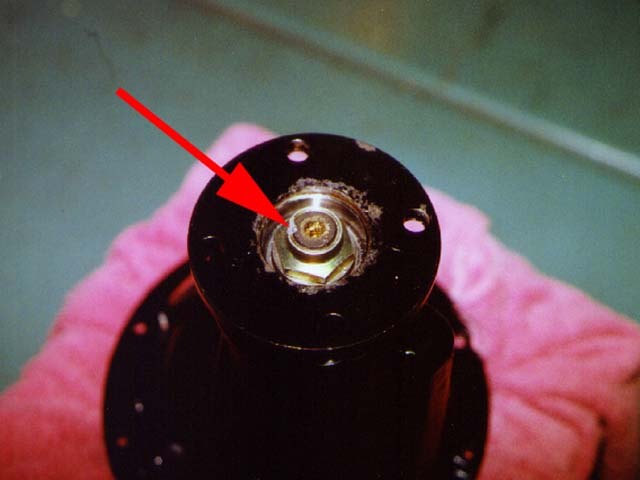 Place the dial indicator on the top of the bearing cap on the ring gear side. 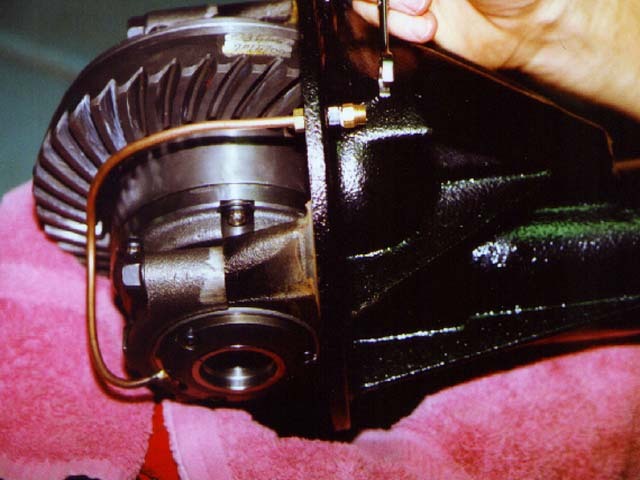 Tighten the adjusting nut on the pinion drive side until the indicator on the dial indicator starts to deflect. The needle may bounce a bit, but I usually wait until I see about 0.001" of deflection that remains once pressure is removed from the adjusting nut. This is the zero preload position. For used bearings, stop here. For new bearings, you want to add a bit of preload to account for bearing break-in. Tighten the adjusting nut another 1 to 1 1/2 notches from the zero preload position. Recheck backlash reading. If the backlash is too low or too high, loosen one adjuster nut as needed. Loosen it one to three notches, and tighten the opposite adjuster nut the same amount. This holds your bearing preload while allowing you to move the ring gear sideways to dial in the backlash. Once the proper backlash is achieved, torque the bearing cap bolts to 58 ft. lb. Recheck the backlash in several locations. Recheck the mesh pattern using marking compound as described above. If the backlash and pattern look good, the gear setup is complete. Replace the lock tabs on the carrier bearing caps. If you are installing an ARB, the remaining air cylinder and air line components can be installed at this time.